Exclusively for members: win a guided tour of the impressive Rose Garden and Elizabethan Mansion house, especially decorated with roses, followed by a refreshing glass of rose fizz and a delicious afternoon tea. As part of Rose Celebration Week in June, you are cordially invited to take part in our ticket ballot exclusive to Possibilities members and join us for a stunning summer's afternoon event at beautiful Borde Hill Garden. 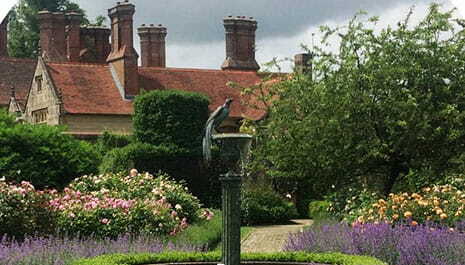 Borde Hill Garden, near Haywards Heath in rural West Sussex, has been home to the same family for four generations. Colonel Stephenson Robert Clarke purchased the Elizabethan mansion in 1893, creating the gardens and woodland with plants brought back to England from overseas by the great botanists of the late Victorian era. The garden is Grade II-listed by English Heritage and renowned for its rare trees and shrubs, set in 200 acres of parkland with stunning vistas. Laid out in a series of outdoor 'rooms', they include the renowned Rhododendron, Italian and Rose gardens. Lucky ticket winners for this members-only event will enjoy a tour of the mansion, where a knowledgeable guide will bring the family history to life. This will be followed by a tour of the Rose Garden and surrounding borders in the expert company of the head gardener, where you can marvel at more than 700 varieties of David Austin roses. Your day will conclude with a delicious afternoon tea in the charming marquee, including a refreshing glass of rose fizz. We are offering 12 Possibilities members a pair of tickets to attend this exclusive and private Borde Hill Garden event on Tuesday 18 June 2019, as part of Rose Celebration Week. Borde Hill Garden, Borde Hill Lane, Haywards Heath, West Sussex, RH16 1XP. By car - Borde Hill is 1.5 miles north of Haywards Heath, 20 minutes from Brighton and Gatwick on the M23 (via junction 10a), and one hour from London. There is free on-site parking. By train - there are direct trains from London Victoria, London Bridge and Brighton to Haywards Heath (45 minutes). Taxis at the station. 1. The ballot is open to all activated and eligible Possibilities’ members (“Members”), except employees of the Promoter or any third party directly associated with administration of the ballot. Please note that for this balloted event ticket winners must only bring guests with them who, for safety reasons, meet the minimum height requirement to travel on Thamesjet of 135 cms, and that all children under the age of 16 years must be accompanied by an adult. .
2. The ballot is free to enter and no purchase is necessary. 5. The opening date for entries is 9am on Tuesday 5 February. The closing date of the ballot is 9am on Tuesday 7 May. Entries received after this time will not be counted. 7. A winner will be chosen by random draw supervised by an independent person on Wednesday 8 May. ("Draw Date"). 8. The winner will receive a pair of tickets visit Borde Hill Gardens in West Sussex on Tuesday 18 June as part of the Rose Celebrations week. Each winner and guest will enjoy a private guided tour of the principal ground floor rooms in the Mansion onsite, specially decorated for Rose Celebration weeks. Followed by a tour of the Rose Garden and surrounding borders with the Head Gardener. Each guest will receive a drinks reception within a private marquee and afternoon tea. Please note that all drinks, food, except any free amount expressed on the event itinerary, any travel to and from this event and any other expenses incurred are the responsibility of the winner and NOT included in the prize. 9. The winner will be notified by email or telephone (using details provided when activating their membership) before midnight on Thursday 9 May. If a winner does not respond to the Promoter within 5 days of being notified by the Promoter, then the winner's prize will be forfeited and the Promoter will be entitled to select another winner in accordance with the process described above. 10. The prize will be sent to the winner by post or email (using details provided when activating their membership). Tickets and / or an event itinerary will be sent to winners no later than five working days prior to the event taking place. 12. The prize is supplied by Saga Membership Limited. The Promoter reserves the right to replace the prize with an alternative prize of equal or higher value if circumstances beyond the Promoter’s control make it necessary to do so.